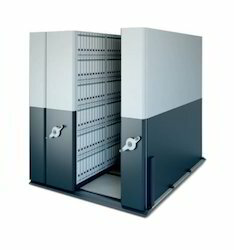 We are a leading Wholesaler of compactor movable shelving system and compacta hand push lcp cabinets from Pune, India. So much to offer with our SMARTSTORE solution having quiet pulley belt drive mechanism and adjustable shelves creating more workspace and delivering enhanced value for money. Total Area Consumed 18 meters-squared For 120 Linear Meter. Total Area Consumed 9 meters-squared for 120 Linear Meter. Wooden Platform with Levellers and Sloping Ramp. Ergonomic Handle with Quite Pulley Belt Mechanism. Self Suspended Installation without grouting. LCP mobile compactor system offers a modern solution for today's increasing need for space maximisation compared to traditional methods of storage. 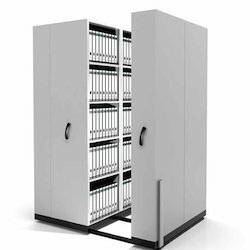 This high density option can dramatically increase storage capacity by up to 100%.